One bedroom apartment, sleeps 5 with free wifi and parking. Don't just visit Dublin, experience Dublin in unique and original apartments. We have named our apartments after Irish nationalist leaders to reflect our location in the historic Kilmainham/Inchicore area. The Pádraig Pearse apartment is situated on the first floor and can comfortably sleep 5. Pádraig Pearse's father crafted the altar in the adjoining St. Mary's Church. Conveniently situated close to 'The Dubline' Dublin Discovery Trail, featuring Kilmainham Gaol and Courthouse and The Royal Hospital Kilmainham, Ireland's oldest public building dating back to 1684. We are just a short walk to the War Memorial Gardens. Our apartments have been restored with great care and attention to detail, retaining the original Victorian features providing classic, comfortable and select accommodation in Dublin. Our apartments are upmarket with attention to detail and our guest comfort our priority. Easy access to all the top restaurants, pubs, museums and attractions that Dublin has to offer. For those who prefer a quicker route than the Dubline trail, the bus stop is almost outside the door with route 13 serving Guinness Storehouse, Christchurch Cathedral, Dublin Castle, Temple Bar, Trinity College and O'Connell St.
A 5 minute walk to the Luas red line,travelling via The Museum at Collins Barracks, The Jameson Distillery, Jervis St., Dublin Convention Centre and the O2. All apartments are located in the one Victorian period property, and situated on a tree lined road adjacent to the magnificent St. Mary's Oblate Church. There are some excellent local pubs and restaurants all within a 5 minute walk with music in the Black Lion pub on weekend nights. Complimentary cell phone available for guests by prior arrangement. All conveniences are provided including linen and towels freshly laundered for your use. 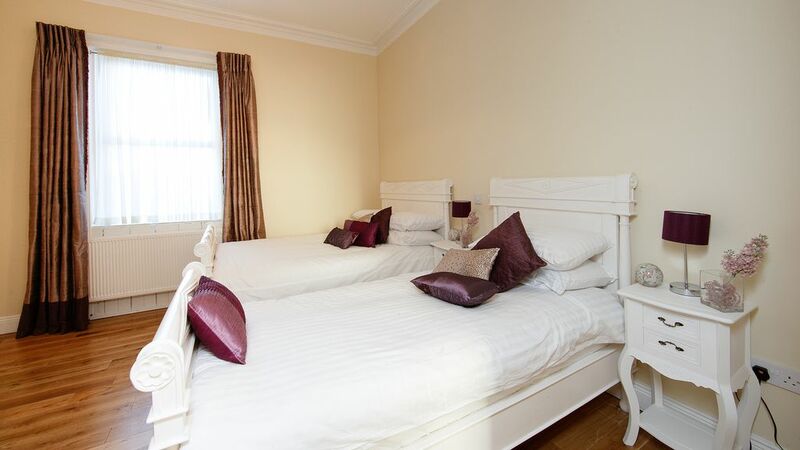 The 'Pádraig Pearse' apartment has one large bedroom with a double bed and twin bed. We have a leather pull out double sofa bed in the living room of both apartments providing extra sleeping accommodation. All apartments have a fully equipped kitchen and dining area. The apartments have extra large bathrooms with power showers and bidets for your extra comfort. They all have a kitchen equipped with fridge microwave, dishwasher, toaster, coffee machine and kettle, so that anyone considering an extended stay can enjoy all the comforts of home. We have laundry equipment in all apartments with the exception of the 'Parnell' studio. A cot can be provided upon request. For anyone considering exploring Ireland further there is a car hire company close by and Heuston Station is approx 15-20 minute walk. Dublin is renowned for it's famous Temple bar area for entertainment which is a bus ride away. For art lovers the Irish Museum of Modern Art is 15 minute walk as is Kilmainham Gaol & Museum. The hop on hop off bus tours are accessible at Kilmainham Gaol. Tesco and Eurospar supermarkets are a 2 minute walk as are pharmacies, banks, hair & beauty salons, pubs, restaurants and butcher shop. On Luas red line, which travels via Heuston Station, The Museum (Collins Barracks), Jameson Distillery, O'Connell St., Connolly Station,The 02, Dublin's big wheel and weekly market. Luas stop a 5 minute walk. Serviced by bus routes 13 and 40 which travel via Guinness Brewery,(5 mins), Christchurch Cathedral,(10 mins) St. Patrick's Cathedral, (10 mins)Dublin Castle, (12 mins) Dame St., Temple Bar and Grafton St. (15 mins), O'Connell St, Griffith Ave (DCU), Finglas and Ballymun. Also serviced by bus route 69 (Heuston Station). From Dublin airport, take Dublincoach to the Red Cow Luas stop via the m50 and transfer to the Luas. journey time 30 minutes. Alternatively, take the Airlink to Heuston Station and transfer to the Luas. If renting a car, reach us via the M50 and M4. Travelling from the South of Ireland, we are on the N7 route to the city centre. Travelling from the West or North of Ireland, we are 5 minutes from the N4. We are happy to arrange collection at the airport and have a driver onsite to look after our guests who may wish to avail of this service. Early check in will be facilitated, if the apartment is unoccupied the night before your arrival. Assuring you of our personal attention to help make your visit to Dublin an unforgettable experience. I'm Gráinne, originally from Co. Kildare and raised in a small family run hotel. I am married to Tim who is now retired from An Garda Siochána (Irish Police). Tim and I purchased this property in 1986 and lived here for a number of years until our family grew and we needed to relocate. We loved living in this area and have many happy memories of our first home here. I have consistently worked in the hospitality industry and always wanted to provide holiday accommodation here as I felt this to be an ideal location. I have been lucky enough to have realized my dream. I pay particular attention to detail and set the highest of standards in cleanliness and customer care. Our aim is to ensure that you really feel at home and comfortable in our apartment and we will endeavor to assist you in any way with any aspect of your vacation, so that you get the most out of your trip to Dublin. We are at the end of the phone 24 hours a day if you need any assistance. Assuring you of our best attention. We chose this location because of close proximity to downtown Dublin. We loved the period red brick property with large rooms. Fantastic large enclosed rear which is very private and unusual for a city centre property. Easy access to any part of the countryside and still only 10 minutes from downtown. Nice residential old part of Dublin with true Dublin characters in abundance. Settled community with lots of nice neighbors whom you can be sure will speak to you if you bump into them. All facilities such as banks, pharmacies, supermarkets, butchers, gas station, restaurants, pubs, hair and beauty salons, dry cleaners, etc on the street. Super public transport with the Luas and Dublin bus. The most unique benefit is the location. Only 10 minutes from downtown Dublin with that real at home feeling when you arrive back after your day out. The house was built in the 1800's and has a lovely spacious and tranquil feeling to it. I love the large rooms and high ceilings with the original coving and open fire which is really cozy on a Winter's evening. In the Summer time, we enjoyed many barbeques out back, and found it peaceful and quiet. One huge benefit and highly unusual in a city apartment is the amount of both indoor and outdoor space. Bathroom is ensuite and has a large walk in power shower, twin basins, bidet and toilet. Spacious 1 bedroom apt with living rm,dining area, kitchen, washer,dryer,and kitchen on 2nd level. Stairs. Double and single bed. Apt is clean and comfortable and convenient to public transportation. Owners very responsive and helpful,makes for wonderful stay in Dublin. Lovely apartment and everybody we met and talked to was extremely helpful (Grainne, Valerie, Rory). We spent almost one week in the apartment and felt absolutely comfortable. Which was more than appreciated since we were on a business trip and had a busy schedule. Have to admit that leaving was kind of sad! P.S. Valerie, sorry for the misunderstanding with the keys, I was a little anxious about the upcoming meeting and wasn't really thinking... Thanks for waiting for us! Many thanks Sara for your review. We appreciate you taking the time to provide feedback.We're delighted you enjoyed the apartment and glad to hear your experience with all our team was so positive. We hope to see you back in Dublin again. and departures (Rory was extremely helpful) and provided enough linens and towels for our group of sixteen. With the bus stop across the street and the nearby LUAS station, you don't need a car, although if you arrive with one the gated parking lot behind the apartment is very secure. All 4 families were very happy with the accommodations, and the well-equipped kitchens which allowed us to prepare and serve dinner for 16 on Good Friday. We will rent these apartments again when we return to Dublin. Conveniently situated close to 'The Dubline' Dublin Discovery Trail, featuring Kilmainham Gaol and Courthouse Museum and The Royal Hospital Kilmainham, Ireland's oldest public building dating back to 1684 which now hosts the Irish Museum of Modern Art, a full size maize and attractive gardens. We are just a short walk to the War Memorial Gardens where one can cross over to the Phoenix Park, Europe's largest enclosed park and home to Dublin Zoo, the residence of both Ireland's president and the US ambassador.